Curium, a radioactive transuranic chemical element, was first synthesized in 1944 by Glenn T. Seaborg, Ralph A. James, and Albert Ghiorso at the University of California at Berkeley. The work was related to the Manhattan Project, so the discovery was kept classified until the end of World War II. The announcement was planned at an American Chemical Society meeting, but Seaborg let the news slip a few days early on a kids’ radio show when a precocious young guest asked if he had discovered any new transuranic elements lately. The name was selected in honor of Marie Sklodowska-Curie and Pierre Curie and their pioneering research in radioactivity. 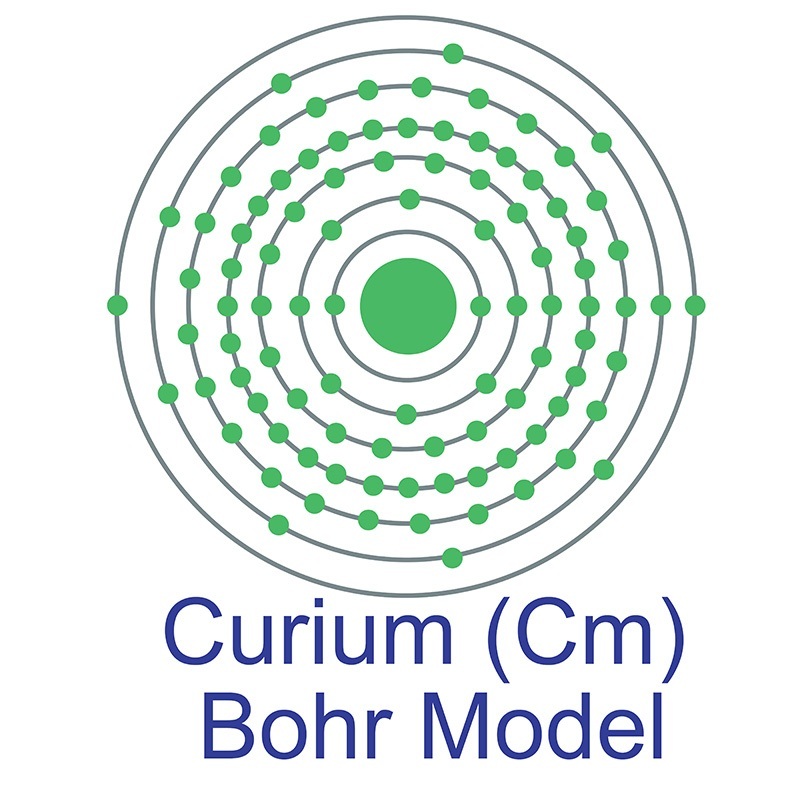 Curium is used as a fuel in radioisotope thermoelectric generators (RTGs), and as an alpha particle source in alpha particle X-ray spectrometers (APXS). AXPS instruments are primarily used in space exploration missions, and have been included in a number of Mars rovers. Curium is also used in the production of higher transuranic and transactinide elements. Curium does not occur naturally on Earth and is typically produced by bombarding uranium or plutonium with neutrons in nuclear reactors. The pure element is hard, brittle, malleable, and appears a lustrous silvery white. Curium is a Block P, Group 3, Period 7 element. The number of electrons in each of curium's shells is 2, 8, 18, 32, 25, 9, 2 and its electron configuration is [Rn] 5f7 6d1 7s2. The curium atom has a radius of 174pm. In its elemental form, curium's CAS number is 7440-51-9. Curium is radioactive. It is produced by bombarding uranium or plutonium with neutrons in nuclear reactors. Curium is found in spent nuclear fuel and small amounts are produced for research. Curium was discovered by Glenn T. Seaborg, Ralph A. James and Albert Ghiorso at the University of California, Berkeley in 1944. The element was named in honor of Marie and Pierre Curie. Curium information, including technical data, properties, and other useful facts are discussed below. Scientific facts such as the atomic structure, ionization energy, abundance on Earth, conductivity and thermal properties are included. Curium is an artificial element. It has no stable isotopes.